Tent in the main square in Uppsala, Researchers’ Night 2011. A simple and uncomplicated way of making information materials available is to set up a tent with information inside, possibly alongside other organised activities. 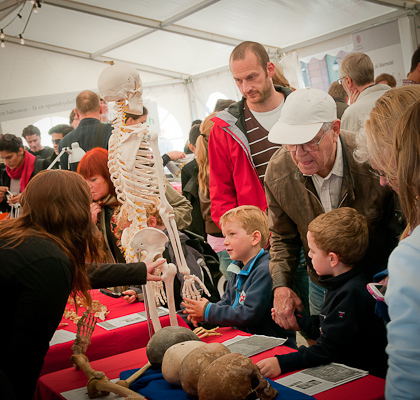 Passers-by can enter the tent and pick up information to take with them if they want to learn more. The choice of location will largely determine the number of visitors. It is of course a good idea to place the tent where a lot of people pass by. Preparations: Decide on a location for the tent and which materials will be made available. Obtain a permit to set up the tent if necessary. Construct or order the tent and prepare information materials. Market the activity. Challenges: Making the tent interesting so that people will stop and get information. Deciding on the quantity of information materials you need for people to take with them. Benefits: Possibility of reaching many people for a small cost and giving visitors the opportunity to choose materials they find interesting to take with them and read later. The tent can be placed where many people pass by.